Thunderstorms and tornadoes are common natural disasters that frequently affect the commercial property owners in Plano. These storm systems have the ability to cause significant water damage and structural damage to structures throughout the community, even if you have focused on preparedness ahead of time. 911 Restoration Collin County understands the urgency of these situations, which is why we stay available 24/7/365 to assist you on a moment’s notice. 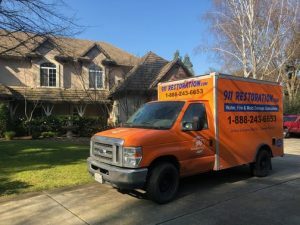 Whenever there is water damage involved in a remediation job, we guarantee to arrive within 45 minutes. It is important to us that we never make you wait long for help because we understand that the longer water is present in your commercial building, the for extensive the damages become. To ensure that you receive the best possible restoration services, we work with IICRC certified technicians who are expertly trained to repair damages specific to commercial properties. We want to be the servicemen that you trust to get your business back up and running after it has become flooded, so call our commercial property damage Plano professionals today. Thunderstorms are a common occurrence in Plano that pose a real threat to commercial property owners in the area. They can cause powerful winds, heavy rain, flash flooding, and lightning strikes. If a thunderstorm is strong enough it can even create a tornado, which can cause even more property damage. To stay safe under these stormy circumstances, it is important for commercial property owners to monitor the weather and take the appropriate precautions. However, even if you do everything right, there is still the possibility of your building becoming flooded or affected by some type of water damage. Thunderstorms are known for causing torrential downpours within a short period of time. This doesn’t allow time for the rain to be absorbed into the ground, so flash flooding occurs. Not only do flash floods destroy properties, but they can be fatal if you get caught out in a storm. They can easily sweep you off your feet, move your car, pull trees out of the ground and destroy bridges. Because of their severity, the best way to stay safe is to simply stay indoors and avoid driving. If your commercial property is affected by heavy rainfall or flash flooding, you can depend on 911 Restoration Collin County to provide you with the assistance you need to make a full recovery. So, give us a call right away so we can begin the remediation process. As mentioned before, tornadoes are another type of storm system that frequents Collin County. Like thunderstorms, they have the ability to cause major property damage and are actually one of the most destructive forces in nature. Most tornadoes create winds that move as fast as 110 mph, with reports of some reaching speeds up to 200 mph. These winds are what makes tornadoes so damaging. They can throw large debris into commercial buildings, breaking windows and causing massive structural damage. Even if a tornado doesn’t damage your commercial property by pummeling it with debris, being in its line of fire can be just as destructive. The winds themselves are strong enough to damage your property’s foundation, breaking doors and windows. If your property is damaged by the powerful winds of a tornado, you can call our commercial property damage Plano experts and be sure that we will provide the remediation effort you need to get a fresh start once the storm has passed.